Fresh food products whiz around the world in mere hours these days. It's great if you want Chilean grapes in the middle of a Minnesota winter, or sushi when you live more than 1,000 miles from the nearest ocean. But the global food trade also has risks. Plant and animal diseases now spread much more quickly. In response to devastating foreign livestock scares like hoof and mouth disease and mad cow disease, the U.S. has launched an ambitious nationwide plan to immediately contain possible outbreaks. To do that, the government says it will have to electronically track all the movements of cows, goats, pigs and poultry in the U.S. The project is already underway in Minnesota. St. Paul, Minn. — The program is called the National Animal Identification System. For now, it's voluntary. But it could become mandatory within a few years. This is how it works: Anyone who owns livestock, even pet goats and llamas, will have to register the address of their farm property with the U.S. Department of Agriculture. The USDA will then plot that property's coordinates in its database and assign it a unique number. The number is called a premises ID. Once the premises has that number, the livestock there will also need numbers. So the government is asking livestock owners to buy special ear tags for their animals that have a 15-digit number embedded in them. The tags emit a radio frequency that can be read with a scanning device. This is how the USDA hopes to track each animal's movements through its lifetime as it moves from farm to farm, or to auction or slaughter. The idea isn't new -- at least not elsewhere. Several countries, including Canada, have a similar system. In 2003, Canada's system was put to the test when BSE, also known as mad cow disease, was discovered just over the border in Washington state. Dave Wiklund is in charge of getting the national animal ID system up and running in Minnesota. He says the Canadian system did what it was supposed to do. "Once they found that it was an import from Canada, they found the tag number from that animal," says Wiklund. "They had it traced within a day." Wiklund is with the Minnesota Board of Animal Health. He says Canada's national ID system helped officials trace the infected cow back to its original herd in Alberta. There, they discovered that cattle were being given feed containing banned animal byproducts that can cause mad cow disease. Canadian officials also found out that 80 more cows from that herd had been sent to the U.S. But from there, the investigation became much more problematic, because U.S. officials didn't have a computerized tracking system. They had some paper records, but they were incomplete. Of the 80 cows that entered the U.S., investigators were only able to positively identify and slaughter 28. Wiklund says the BSE case is the perfect example for why the U.S. needs an animal ID system. He says it would protect consumer health and livestock owners who face a needlessly prolonged disease scare. "When that happened, the prices of cattle went down," say Wicklund. "It closed many of the borders to the United States. The United States exports a lot of beef. And if we can't export that we cannot eat it all ourselves here, which drives the price back down." 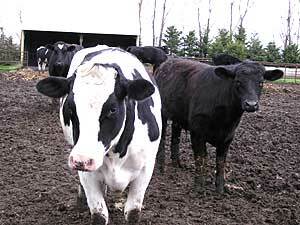 Fifty-three countries banned American beef imports because of the 2003 mad cow case. Still, convincing all Minnesota livestock owners that a national animal ID system is necessary might not be easy. So Dave Wiklund isn't shy about recruiting others to help him promote the system. On a recent spring afternoon, Wikland spoke to a group of University of Minnesota veterinary students. He told them they're on the front lines when it comes to dealing with farmers. He says they should take an active role in encouraging farmers to participate. But the vet students seemed a bit confused about how the ID system will work. After class, senior vet student Tristan Malmedal pulled Wiklund aside and quizzed him about a scenario that he might face. "If I'm identified as one premise and something breaks, you're going to shut me down completely," said Malmedal. "If I've got two separate herds that are maintained that way at separate premises, one's identified here, how do I keep from you guys from controlling (the other herd)?" Dave Wiklund assured Malmedal state veterinarians would conduct a thorough disease investigation. "And if they determine that this one isn't involved in it at all, there's no transfer of animals back and forth, that there's no disease risk between those two herds, that they're completely different, then there's not going to be a problem there," said Wiklund. After the exchange, Malmedal said he agrees that some sort of national ID system is necessary to track animal diseases. But he hopes the government doesn't make it too complex. "(There are) a lot of bugs that need to be worked out of it, I think," said Malmedal. "It's a good idea, but it's just a matter of getting it implemented, and implementing it properly, to where it's going to be useful and not just a waste of taxpayers' money." Twenty miles west of Brainerd, near the small town of Motley, cattle farmer Les Bell is not at all swayed by what he's been hearing about the national animal ID system. "Why do they gotta keep track of me, and why am I going to be under surveillance?" says Bell. "I think it's pretty heavy-handed. I don't think we need that kind of government intervention in our everyday business." Bell doesn't believe that U.S. officials will use the system just to track animal diseases. "I have enough vision, I can kind of see what's coming with this premise ID and with the national ID," says Bell. "They want to be able to regulate. And the only way they can regulate is to identify all us guys, and exactly how many head of livestock we have." Bell is afraid the USDA will share the information it collects about his herd with the IRS or the Minnesota Pollution Control Agency, or speculators who will manipulate market prices. There are proposals in the Legislature and in Congress right now that would keep that data private. But that doesn't satisfy Bell. He says other farmers in his area feel the same way. And he says he knows that some of them will stop renting their pasture land to him if they have to get a premise ID. A national animal ID system does have some farmer support. Just outside of Northfield, beef farmer Ray Larson says he welcomes it. Larson sells about 150 animals a year. As they grow, he moves them through a series of different outdoor pens. At this moment, he's standing by a pen that holds his largest cows -- the ones that will soon go to the auction barn. "Here's a big one," Larson says. "She's probably close to 1,400 pounds. See the front here, the brisket, how it's starting to fill out? And the back, we look for little fat pockets there in the back." Larson says an ID system would help reopen some U.S. export markets. He says it's the only way to assure consumers that their food supply is safe. "I think it's been real obvious with the scare with BSE that we need to know where our animals originated from, where they go to be fed or conditioned or fattened, and where they ultimately end up for slaughter," says Larson. "I think it has to be tracked all the way through. So it's just a necessary thing that has to happen." Farm groups ranging from dairy to swine producers agree, and have signed on to the system. But even with such support, the creation of a national animal ID system won't be an easy undertaking. The government still has to figure out how much information it wants to gather and how it will use that information. No matter what they decide, Dave Wiklund says there will be no getting around that fact that there will be millions of constantly changing records to manage. "We're starting at the foothills of a giant mountain right now," says Wiklund. "To actually climb there and get into place is going to be many years of hard work and resolve. Hopefully it won't take another disease outbreak to have this happen." The USDA wants to make the National Animal Identification System mandatory by 2009.